There is a disturbingly consistent trend in the United States. On average every year, about 37 children die of heatstroke in a vehicle after being trapped inside. This number is not very large in the grand scheme but these incidents are extremely preventable. This is the leading, non-crash related, vehicle death for children nationwide. The chart below shows that the trend line over the past two decades is alarmingly flat. What you probably didn't know is that this month, July, is the most dangerous time of the year. You probably also didn't know that this type of death can occour on relatively mild days. The details are horrific for any parent to imagine; a rapidly rising temperature that reaches an unlivable level in only a few short minutes. The child is either restrained or does not understand how to properly operate the door handle. It is tragic. The circumstances of these deaths are not widely known; which, in turn, means parents are ill-equipped for prevention. A few months ago there was a spat of articles and blog posts concerning whether it is okay to leave your child in the car for the few minutes in order to run a quick errand such as grabbing a gallon of milk. Commonly there are not negative repercussions for such a decision. However, sometimes authorities are called and some type of legal ordeal ensues. Finally, a much worse alternative occurs: The child dies. However, the typical conditions for such a death are not well known. As I became curious about this question, I turned to common and publicly available data sources related to general health but was disappointed to find nothing. What I did find is a large amount of resources developed by volunteers. There is a small campaign by the Department of National Highway Traffic and Safety Administration (NHTSA) but no raw data was offered, only summary statistics. After a small amount of digging on the topic I ran across the website of Jan Null, a meteorologist at San Jose State. 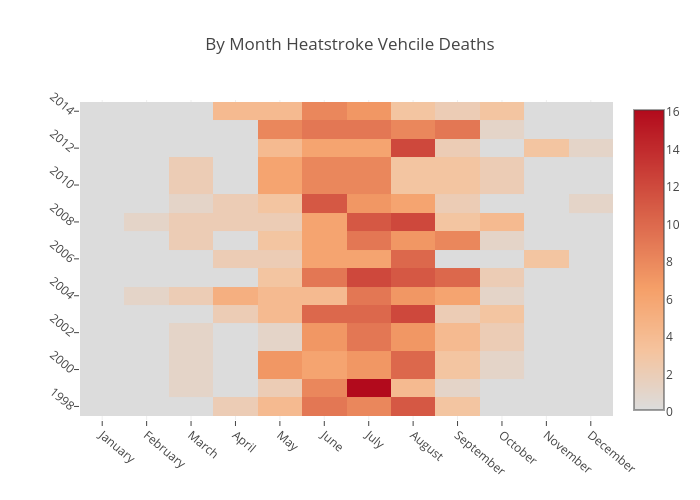 Jan probably deserves an award for what he has done concerning the data of heatstroke deaths. A few years ago, he observed that there was not a reliable source of data for these types of deaths. So he developed his own database. When a death occurs, he scours public records and reports and then extracts as many as 25 different pieces of information about the event. His effort has resulted in the most comprehensive and reliable dataset related to heatstroke deaths of children in vehicles. In a strange twist of priority the NHTSA (and seemingly everyone else interested in the topic) now uses his data as the authoritative information source. Upon request, Jan allowed me to use his hard earned data to write this article. With a rich source of information about these deaths, we can explore the sets of conditions that lead to these very preventable incidences. I will walk through the data on three levels; circumstance, location and time. The first consideration of interest is how the child got into the vehicle in the first place. The following pie chart shows the distribution. As you can see, the majority of children are simply forgotten in the vehicle. However, a large portion of children are intentionally left behind. Perhaps the child was sleeping or some other condition, like a quick trip inside, was used to justified the act. The description of place of death is also informative. The primary (and obvious) factor related to the deaths is temperature. The following chart shows the frequency of deaths by month and temperature. Simply because it is hotter during the summer months, the majority of deaths take place in June, July, and August. The temperature above which 95% of all deaths take place is 75 degrees Fahrenheit. For most places in the country that includes spring, summer and fall. However, it is worth pointing out that several deaths take place at temperatures much lower than 75. One important consideration is that when left at rest vehicles turn into ovens. A rule of thumb is that after about 30 minutes at rest, the temperature inside a car is 34 degrees hotter than the outside temperature. In just one hour, the thermometer inside a vehicle would be 43 degrees hotter than outside. Because heatstroke for a child starts at 104 degrees, a relatively mild day can become deadly in a short period of time. Of course, the younger a child is, the more susceptible they are to this tragedy. The following visual shows the deaths by age of child (in months) and the time in which they were in the vehicle before being discovered. There is an obvious clustering of children that are 36 months and younger of those that are forgotten or left behind. For a child under 3 years of age, any duration longer than half an hour is very dangerous. Older children who make their way into the car on their own tend to be between four and eight years of age. Because temperature is the primary factor related to heatstroke deaths, it is worth exploring in what places death occurs. The following is a map of deaths by city in the United States. It is clear that the majority of deaths take place in the southern most states. The following chart shows the latitude (north/south measure) by month for frequency of deaths. This view shows that 95% of all deaths take place at latitudes south of Boston (the majority of the country) but tend to concentrate along the level of Dallas and Las Vegas. The southern states are obviously going to be the most dangerous states for heat related vehicular deaths. Florida has the most wide spread geographic reported deaths and Texas has the most (at 95). Most states tend to concentrate deaths in the major population areas. There are four states that have never reported a death; New Hampshire, Vermont, Wyoming and Alaska. In addition to location specifics, it is also worthwhile to take an in-depth look at time based views. This first heatmap shows, by day, the deaths in the past five years. There is obviously a much larger occurrence in the summer months. However, there are several notable exceptions (as shown before). In particular, one week in 2012, during November and December there were four deaths. In order to better view the by month data the following heatmap shows the density, by year, for the period that data is collected. One last important view is the day of the week information. This first view shows the frequency of deaths by day of week. There is a consistent trend where children that are forgotten seem to be mid to late workweek and then taper off on the weekend. However, those that are intentionally left behind stay fairly consistent and kids that gain access on their own peeks on Sunday. Another interesting view to compare is, by day of week, how long the child was in the vehicle. This view shows a trend, similar to those who were forgotten, where duration in the vehicle is longer (on average) during workweek days and shorter on the weekend. Heatstroke deaths of children in vehicles are a tragic trend. Parents need to know that leaving a child in a car, even for one minute, is extremely dangerous. Please understand that there is no excuse for leaving a child. However, you should be exceedingly diligent on days hotter than 75 degrees. Set a series of reminders to help yourself not make the worst mistake of your life. While there is no panacea for parental diligence, there needs to be a formal push to adopt technical solutions to help busy parents remember. In today’s digital age, with reminders for everything from pills to seatbelts, this problem sorely needs the nation's (and auto maker's) attention. Interior weight or motion sensors tied to climate control, smart phone automatic reminders, or automatic car alarms are all simple solutions that could be deployed today. There is a precedent for such a change. In the past half-decade most new vehicles have been equipped with back up cameras. This simple change has shown real promise in reducing back-over deaths. If we work on smarter ways to address the problem of children left unattended in vehicles, we would hopefully see similar reduction in the tragedy of heat related deaths.